1. Place the gammon, pepper and bay leaves in a large pan. Cover with cold water and bring to a simmer, cook according to pack instructions, adding boiling water as needed. Ensure the gammon is cooked thoroughly and juices run clear. 2. Preheat the oven to 220ºC, gas mark 7, line a roasting tin with foil and place the gammon on top. Remove the string and skin with a sharp knife, leaving a layer of fat. Score the fat in even lines. 3. Place half the sugar, 1 chilli, the ginger and the finely grated zest and juice of 1 lime in a processor, blend to a paste. Stir in the remaining sugar. Rub this over the fat then roast for 12-15 minutes, basting twice, until the edges start to colour. Remove from the oven and leave to rest. 4. Meanwhile, finely chop the remaining chilli, mix into the Chinese leaf with the remaining ingredients, season and add 3-4 pinches of demerara, to taste. 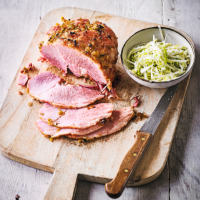 Carve the gammon and serve with the slaw.